A new research study from the University of Leeds discovered that natural substances found in green tea and red wine may reduce the risk of Alzheimer’s disease1. Alzheimer’s disease is described as the gradual and continuous loss in cognitive abilities that results to memory loss, poor language skills and inability to do normal daily activities. It is developed by the formation of amyloid plaques and neurofibrillary tangles in the brain, leading to synaptic and neuronal cell death2. Amyloid plaques are composed of beta-amyloid proteins which clump together forming sticky, toxic balls of different shapes and sizes. They are deposited on brain cells by adhering to proteins on the outside of the cells called prions. This causes the brain cells to slowly die. Presently, an astonishing 5.4 million people are diagnosed with Alzheimer’s in America. This disease is the sixth leading cause of death in the United States, according to the Alzheimer’s Association3. Green tea has multiple health benefits. It contains a chemical called epigallocatechin gallate, better known as EGCG. This natural chemical is thought to be effective in slowing down the process of a certain type of leukemia, reports Mayo Clinic4. Green tea is also known for having health benefits from catechins – substances that have disease-fighting properties. What is in red wine? Having one glass of red wine with your evening meal is good for you. Red wine contains a nutrient called resveratrol which protects blood vessels, helps prevent blood clots from forming and lowers bad cholesterol. Red wine also has flavonoids which contain antioxidants that protect cells from free radicals. 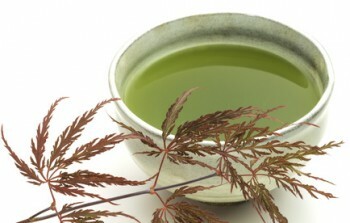 How do nutrients in green tea and red wine work at preventing Alzheimer’s disease? Researchers at the University of Leeds1 formed amyloid balls and put them in test tubes along with the brain cells of human and animals. Upon adding pure extracts of EGCG and resveratrol, they were amazed with the results. They observed changes in the shape of the brain cells which made it difficult for the amyloid balls to attach to the prions. This reaction caused an interruption in the pathway of cell disruption. Hopefully, this new finding is one more step towards creating medications that can stop the progression of Alzheimer’s disease in people who are already affected by it. 1Rushworth JV, Griffiths HH, Watt NT, Hooper NM. Prion Protein-Mediated Toxicity of Amyloid-β Oligomers Requires Lipid Rafts and the Transmembrane LRP1. The Journal of Biological Chemistry 2013. 3Alzheimer’s Association. 2012 Alzheimer’s disease facts and figures. Alzheimer’s and Dementia: The Journal of the Alzheimer’s Association. March 2012; 8:131–168. 4Shanafelt TD, et al., Mayo Clinic Rochester, Rochester, MN; Mayo Clinic Arizona, Scottsdale, AZ. Phase II Trial of Daily, Oral Green Tea Extract in Patients with Asymptomatic, Rai Stage 0-II Chronic Lymphocytic Leukemia (CLL). J Clin Oncol 2010; 28:15s.